Chop the onion and put it in a large pan with 3 tablespoooons of olive oil. Meanwhile, dice the pancetta/bacon and when the onion is golden add the pancetta/bacon in the pan and cook it for just 5 mins. Put the water for pasta and in a bowl, whip eggs with a fork, add salt and pepper. Grate 1/2 cup of parmigiano and add it to the eggs. “Buttare la pasta” when the water is boiling. Strain the spaghetti one minute before the cooking time, add them to the pan and pour the mix with eggs and cheese. The egg will cook a little, so you have to continue mixing. 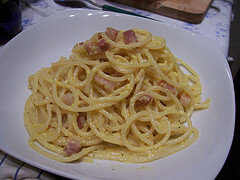 It’s up to you to choose when you think egg is enough cooked: some people prefer the carbonara a little bit less dry then others. The dish is ready! You can add some more parmigiano, as my bf likes! This entry was posted	on Wednesday, November 11th, 2009 at 5:50 am	and is filed under Cooking Time, English Version. You can follow any responses to this entry through the RSS 2.0 feed. You can leave a response, or trackback from your own site.